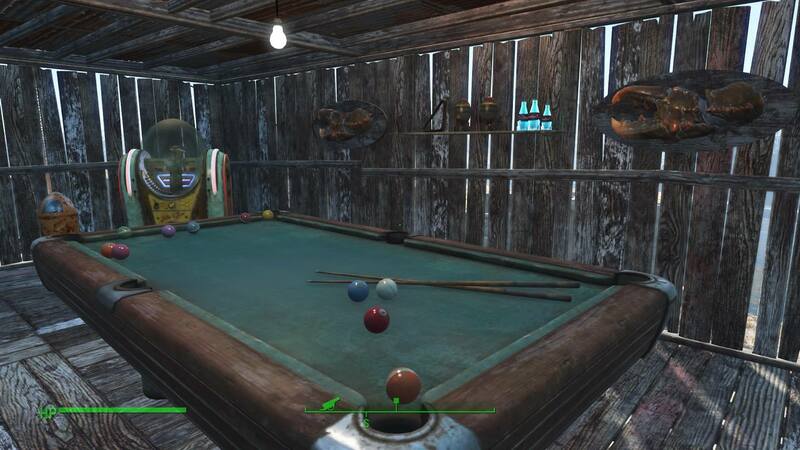 Fallout 4 is highly addictive and regardless of the occasional bug, it'll find a way to keep you hooked for hours. Fallout 4 was released last week (10th November 2015) and I like many, sat eagerly next to my console waiting for that little message to pop up just after midnight letting me know that it was now playable. 3½ hours later, I had lost my wife, my son, my home had been blown away and I had taken on a Deathclaw. In short, I was hooked. Fallout 4 is an RPG mixed with FPS style mechanics in a vastly open world that’s full of places to explore, different people to meet and most importantly, difficult choices that you have to make. Developed by Bethesda, the game is instantly recognisable, and for fans of the series, easy to get into due to the fact that it’s built on the same engine as The Elder Scrolls: Skyrim, Bethesda’s last open world RPG. The story takes place in Boston, 200 years after a war over resources ended in nuclear holocaust. With a very similar story to Fallout 3 (albeit reversed) Fallout 4 kicks off with a basic search for your missing son, and gradually evolves into something much more complicated thanks in part to the on-going struggles between several groups that are fighting for control in the region, leaving you the player with the tough choice of who to side with in order to progress. And those choices aren’t easily made, as I found out when I was offered the chance to join the Brotherhood of Steel, a choice I declined due to bad memories from Fallout 3. As is to be expected with any of Bethesda’s big open-world games, the main story falls short in comparison with the huge number of well-written side quests that you’ll discover as you wander across Boston, or as it is now known, The Commonwealth. I’ve only done one of the missions from the main quest simply because I wanted to explore more of The Commonwealth before hitting the main city. Simple missions can become much more interesting as you notice something else on your journey, or come under attack and have to take shelter in the nearest building, which would then need exploring in case any valuable loot is lurking in the shadows. Fallout 4 is Bethesda’s most diverse world yet, and exploration has its many rewards, with run-down urban areas, menacing dead forests, gloomy fog-infested swamps and the empty radioactive area that is ground zero. But it’s not all doom and gloom, as there are some areas in The Commonwealth that are full of rich colours and hospitable environments, such as the various settlements and farms you stumble on as you journey across the land, that it makes it almost impossible to just focus on the actual story. As mentioned Fallout 4 boasts a lot more colour than the previous games, (most notably Fallout 3 which used a lot of greys and browns that were mixed in with the constant grey clouds seen overhead), as it shares Fallout: New Vegas’ clear blue skies and adds in a mixture of different weather effects to create something that can vary between looking beautiful, (the sun shining through fog covered trees early in the morning), to outright terrifying (radiation storms that make all the distant shadows look like Deathclaws on the prowl), the attention to detail is amazing. 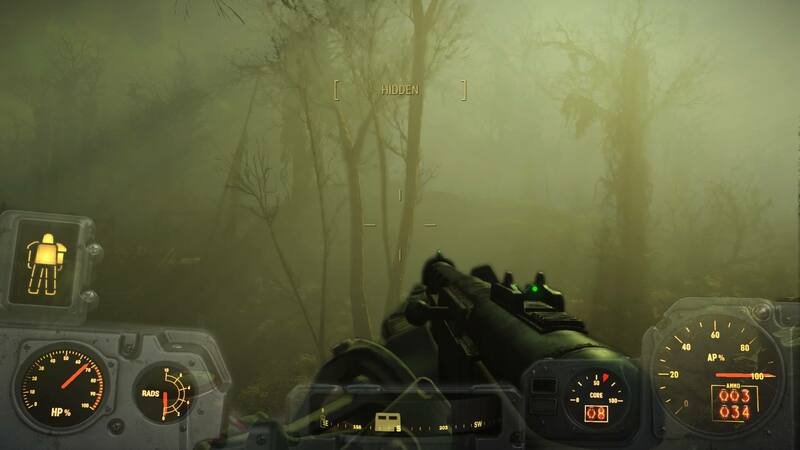 Little things such as raindrops on your visor, clothes getting wet, being able to move items about in your home (this plays havoc with my OCD), the Pip-boy screen changing when you’re inside your power armour and other countless factors build a constantly impressive game. Combat has also seen an improvement since the last game, and even though the VATS system is still there (I personally never use it) the game has a stronger FPS feel to it. Although it may not be as polished as some of the bigger FPS games available, like Call of Duty or Destiny, it still holds its own resulting in a great experience. Companions also seem to have been improved, with each companion having their own skills, likes and dislikes but as is often the case with A.I, they generally tend to just get in the way, especially if you’re a stealth based player. One of the items that plays a bigger part in Fallout 4 than any of the previous titles is power armour and as it stands, using it can make the game feel either a little too easy, or too hard, depending on the situation. Enemies in power armour require more than just an all guns blazing tactic, as you have to chip away at their health whilst at the same time keeping an eye on your own. Too many times have I been caught up in a firefight and not noticed my health quickly diminishing due to attacks from all angles, which is a result of the difficultly levels being steeper. However that being said, if you’re the one in power armour, it becomes a whole lot easier, as it almost feels like a walking-tank, meaning you can grab the biggest weapon you have and open fire. It takes away that feeling of building your way up to being the most powerful thing in the wasteland (something that was present in the earlier games) when you know that if the fight gets too tough, you can just go and get power armour. Bethesda have tried to balance power armour out by introducing fusion cores to run them, but if like myself you hoard things, then you’ll soon find yourself with a stockpile of fusion cores and power armour frames just waiting to be put to good use. And if hoarding wasn’t a big enough problem in my real life, Fallout 4 actively encourages it, as the majority of items found out amongst the ruins of The Commonwealth can all be used in the new base-building aspect of the game, as each item is made up of material components that are vital for certain elements such as power generators or machine gun turrets. The amount of times I’ve had to go out into The Commonwealth to find ceramic materials is beyond count at this point. These materials also play a vital part when it comes to crafting armour and weapons and some of the results can be pretty fantastic. My perfectly arranged pool room. Complete with jukebox and mini-nukes. If you have the right materials, you can turn a basic pistol into whatever takes your fancy, myself opting for a scope and long barrel to turn it into a good mid-ranged scoped weapon that does decent amounts of damage. And it isn’t just the stats of the weapon that are effected, as nearly every little modification you make alters the overall appearance, you can create weapons to match your style. Likewise, the new armour system allows you to piece together up to six items of clothing to create a look that genuinely looks like something found in a post-apocalyptic waste land. You can equip a head piece, chest piece and armour for both legs and arms, all of which can be upgraded with the use of collected materials. However, it has to be mentioned that only certain items of clothing allow you to add armour pieces over the top which I was a little bit gutted about when I found my new Atom Cats outfit was unable to equip some of my custom made armour. Fallout 4 is such a huge game, that even with my 50 hours’ worth of game play, I have yet to scratch the surface. The open world exploration, crafting, and general atmosphere of Fallout are all integral to how the game feels and plays. From the feeling of first exiting Vault 111 or frustratingly moving all my components down to a new settlement, I’ll definitely be playing Fallout 4 for a long time to come. It you like big open world RPG’s with a plenty of action then Fallout 4 is what you should be playing.